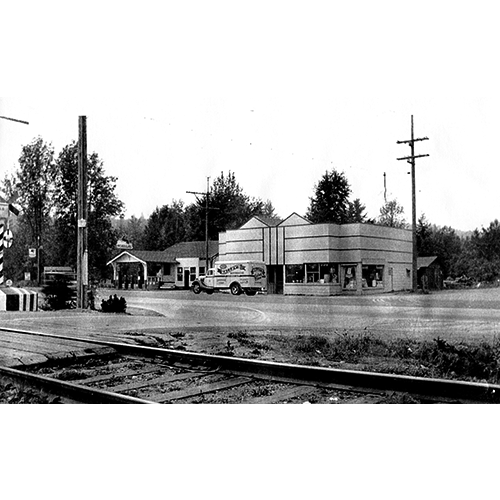 The main intersection in downtown Kenmore at 68th Avenue and Bothell Way, circa late 1930s, has seen many changes over the decades. Mitchell’s General Store opened in 1919 on the site of the burned-out Hitsman Dance Hall. James and Sarah Mitchell lived in a tent at the rear of the property during construction of the store, which later was operated by the Mitchell’s son and his wife, DeLancy, and Georgia Mitchell. Today the site is occupied by Jiffy Lube. The Mobil Gasoline station visible to the left was owned by Edward and Eliza Mahler, parents of Sarah Mitchell. The Mahlers operated the gas station from 1920 until Edward’s death in 1946. The railroad tracks in the foreground were laid by the Lakeshore & Eastern Railway. The railroad reached Bothell on Thanksgiving Day, 1887. Nine years later, it became the Seattle & International Railway, which had plans to extend the line to Canada. Northern Pacific Conglomerate took over the railroad in 1908. Trains ran under the NP banner until 1970 when Northern Pacific merged with Great Northern to form Burlington Northern Railway. The track was abandoned in 1971. The Burke-Gilman Trail opened on the old railroad right-of-way in 1978.